I headed out with two of my friends, Brett and Riley, to the same lake previously fished. It was going to be a beautiful day with low winds and temperatures in the forties. Since it was going to be so nice out we decided to spread out and cover a larger area. The first fish of the day was a keeper Walleye I caught on an orange jig tipped with a minnow. After catching the first Walleye, I decided to stay in the same spot while Riley and Brett worked a few ledges in different depths. 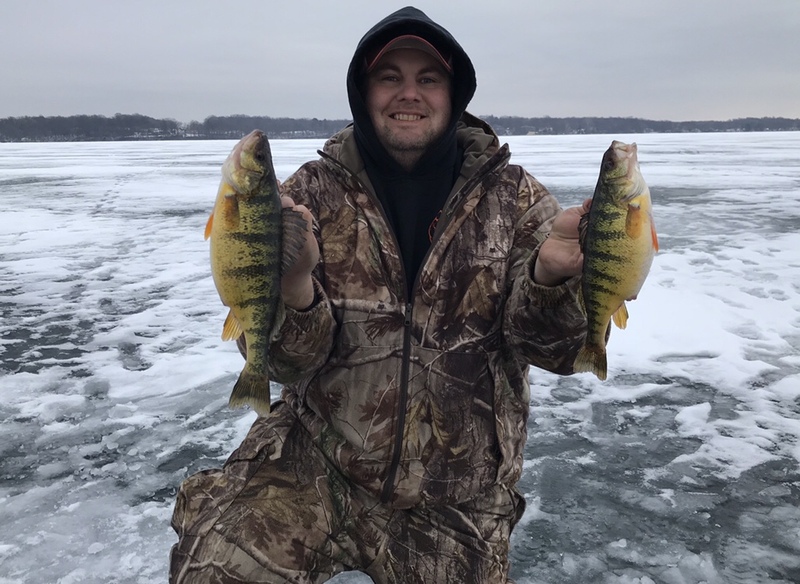 It didn’t take long before they started catching a bunch of small Perch. Brett got on a streak where he couldn’t get a rod back in the water before another one was getting hit. It took a while before Riley figured out the bigger Perch were in shallower water. The small fish were hitting just about anything you put down there but the big ones wanted a little movement right on the bottom. We were able to catch some Jumbos scattered out but never got into a school of big ones. It appeared the bigger fish were roaming alone and nowhere near the small ones. It was a long day on the ice with a very slow bite in the afternoon but, as always, we had a lot of fun. With a little bit of work we found a great pile of fish.